Palm Prepping Centro 2 With webOS? According to a report by PalmInfoCenter, Palm is rumored to be working on an update to the Palm Centro that will run the new Palm webOS. The Palm Centro has been a major success for the company selling millions of units. They reference a snippet from PCMag speculates that a candybar form factor without a QWERTY keyboard could be in the works. The legacy Palm OS has served the company well, but it would certainly make sense for the company to transition those users to the new webOS. From a support standpoint alone, Palm could focus on support just two platforms. One of the reasons for the Centro’s success has been the price. If they were to develop a low-cost entry level Centro running webOS, it would sell in droves. Palm has teamed up with InStyle.com for a promotion to give away 10 of the new Vibrant rose Centro smartphones. The new Centro smartphones come with Facebook, increased user memory and a new soft touch finish. For a chance to enter, head on over to Palm for a chance to win. No purchase necessary. Sweepstakes ends on November 30th, 2008. Palm today announced improvements and new colors for the Palm Centro for Sprint Wireless. Available starting on October 19th, the Palm Centro on Sprint Wireless will be available in both Olive and Vibrant Rose and feature double the amount of user storage (128MB user storage up from 64MB). The new colors also feature soft-touch finish. Users can also expand their memory to 4GB by adding a microSD card. Pink and Red will no longer be offered, but Onyx Black will still be available. Bundled with the new Palm Centro for Sprint is Facebook for Palm and Google Maps. The new Palm Centro for Sprint will be priced as low as $79.99 (with a 2-year agreement). The Olive green and Vibrant rose Centro smartphones will be available as early as Oct. 19 at select retail locations, and beginning Nov. 2 in Sprint Stores, consumer and business sales channels, and online at www.sprint.com/Centro and the Palm Store (http://store.palm.com). The new colors will be available for a special promotional price — as low as $79.99 with a two-year subscriber agreement and $100 mail-in rebate and $25 or higher data add-on or Everything plan with data(3) — through Jan. 10, 2009. Palm has announced they have surpassed the 2 million mark, this just a few months after it was announced they had surpassed the one millionth Centro sold. The low price point, Treo refined experience and pocket-friendly form factor have made the Centro a best seller for Palm. It also speaks volumes about how the Palm OS, despite it’s age, is still a preferred OS for smartphone owners, many of which are first time smartphone buyers. Expect this trend to continue, with the Centro now available for all major US carriers include Verizon, AT&T and Sprint. Those with T-Mobile have the option of the unlocked Palm Centro. Palm also continues it’s international sales with the Centro being available in over 25 countries. Recent data released by AdMob, the largest advertising network on the mobile web, further echoes the momentum of Palm’s smallest, lightest and most affordable smartphone. According to the company’s Mobile Metrics report, Palm Centro leapt onto the list of mobile phones worldwide in May as the No. 8 device, and moved up in June to No. 7. AdMob cites the growth of inexpensive phones, such as Palm Centro, as a primary driver in mobile Internet usage. "Consumers are ready to do more on their mobile phone, and Centro has struck a chord around the world, said Brodie Keast, senior vice president of marketing for Palm, Inc. "Centro has everything a person needs to stay connected with everyone who is important to them — and at a price point and size that make smartphones more attractive to a much wider audience. Palm has released a Centro software update for Sprint customers only. The Sprint Centro software update 1.07 offers a variety of enhancements. Updated compatibility for Google Mobile Maps My Location feature to approximate your current location great for directions, finding nearby restaurants or business, or checking local traffic. The Centro Software Update for Sprint is available for download from Palm’s website. Palm and AT&T have a new limited time promotion for AT&T Centro smartphones, including the electric blue Centro announced just a few days ago. The Palm Centro on AT&T is now available for as low as $69.99 with a 2-year agreement and a mail-in rebate. The Palm Centro on AT&T is available in glacier white, obsidian black and the new electric blue. The promotion runs from July 11th through September 20th. Palm today announced the introduction of a new Glacier Blue color for the popular Palm Centro. The Glacier Blue Palm Centro will be available starting Friday for AT&T Wireless customers by visiting www.att.com and www.palm.com/centro. Palm has also hinted of an upcoming “Back To School” program that will make Centros “more affordable than ever”. We expect to have more information on the promotion by Friday. Palm today announced the release of the Palm Centro in an unlocked version for US customers. 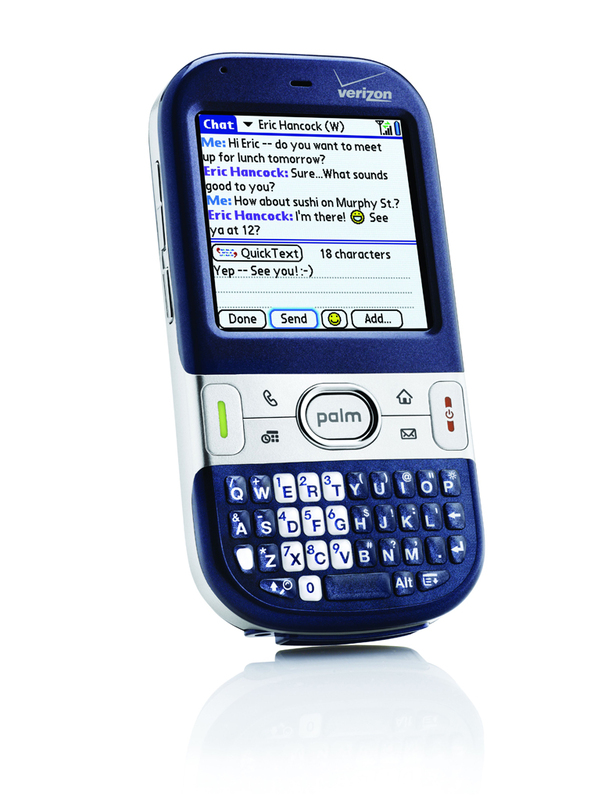 The unlocked Palm Centro is white with grey accent keys. The unlocked Centro retails for $299 and will work on any GSM carrier including AT&T and T-Mobile. This brings Centro availability in the US to Sprint, AT&T, Verizon and now an unlocked model. Also available starting tomorrow is Google Maps for mobile with My Location on Centro, giving customers faster access to local maps and driving directions. Google Maps for mobile with My Location will be available free of charge for Palm Centro smartphones at http://www.google.com/gmm. Please check the site for details on the download process and carrier availability. Verizon Wireless and Palm, Inc., today announced that the Palm Centro smartphone will be available beginning June 13. 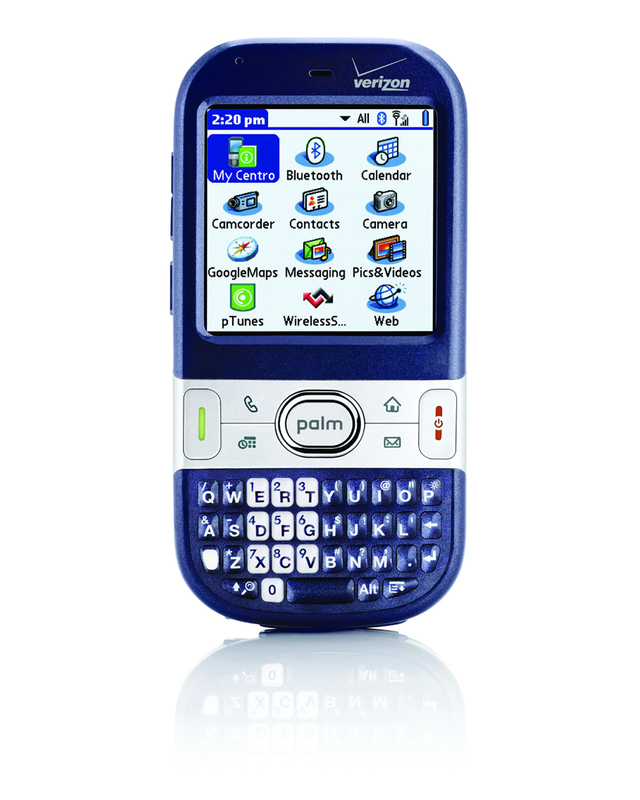 The Palm Centro on Verizon Wireless will debut in cobalt blue at $99.99 (with 2-year agreement, after rebate). Centro runs on Verizon Wireless’ high-speed data network, which gives customers the ability to quickly send and receive e-mail messages and attachments and browse rich Web content. Verizon Wireless customers can also use the Centro as a modem for their laptops when they subscribe to Verizon Wireless’ BroadbandAccess Connect service plan. The handset sports a vibrant color touch-screen, full QWERTY keyboard and a lightweight design. Centro’s built-in Google Maps application delivers quick, reliable directions and lets users perform local searches and view moveable/scalable maps, satellite imagery and traffic updates. Customers can also map a contact’s address directly from the contact application simply by selecting the “maps button. Customers using the stylish Centro will get access to VersaMail 4.0 with built-in Microsoft Exchange ActiveSync support for Microsoft Direct Push Technology to deliver e-mail and calendar updates from a home or office PC using Outlook directly to their handsets. Centro users also have the option of using Wireless Sync, Verizon Wireless’ proprietary e-mail solution, for quick and easy access to personal or corporate e-mail, contacts, calendar and tasks from their home or office PC. Wireless Sync supports POP3 or IMAP e-mail accounts and it supports Microsoft Exchange, IBM Lotus Notes and IBM Lotus Domino. The Palm Centro smartphone will be available online at www.verizonwireless.com and in Verizon Wireless Communications Stores, including those in Circuit City, for $99.99 after a $70 mail-in rebate with a new two-year customer agreement. Customers may want to pair their Centro voice plan with Verizon Wireless’ E-mail and Web for Smartphone service for $29.99. This is an unlimited monthly data plan for Web browsing and e-mail support for up to eight personal e-mail accounts. To tether the Centro to a laptop with a USB cable, customers may opt to include a BroadbandAccess Connect plan in their service package for $30. According to research firm IDC, Palm has increased their market share from 7.9% in Q4 07′ to 13.4% in Q1 08′ on strong sales of the Palm Centro. of 2007 to Q1 of 2008. The Centro was only available through Sprint at the time, so these numbers could carry through to the next quarter. Clearly, Sprint’s aggressive ad campaign combined with Palm finding a new demographic with the pint-sized Centro have had an immediate impact. More impressive is that Palm saw their numbers rise while Apple saw a decline from 26.7 to 19.2 percent. Massachesetts based research firm IDC released the report today. Apple is expected to announce a new 3G compatible iPhone in the next week. Rumors are abound that a price point of $199 is possible for either the existing iPhone or the 3G iPhone through an AT&T subsidy. Palm is expected to release the Centro on Verizon Wireless this month. The company will certainly see a boost with the forthcoming Treo 800w and Treo 850 models due out in the coming months. This will be followed by new Palm devices slated for 2009 that will run Palm’s next generation Palm OS 2.0.